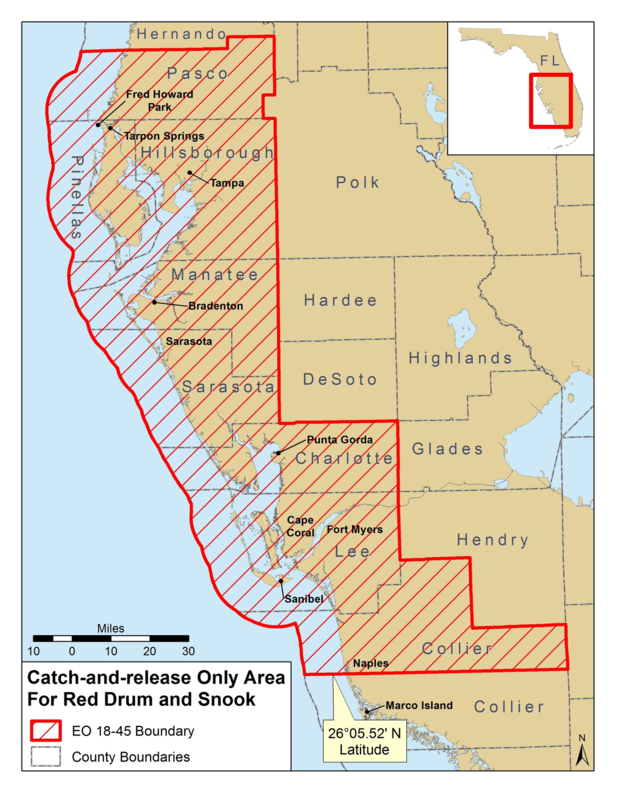 At its September meeting in Tallahassee, the Florida Fish and Wildlife Conservation Commission (FWC) directed staff to expand a recent mandatory catch-and-release only measure for snook and redfish due to red tide. The mandatory catch-and-release ruling will begin on September 28, 2018, through May 10, 2019. The areas include Gordon Pass in Collier County and all of Manatee County through the northernmost point of Anna Maria Island in Manatee. Tampa Bay (including all of Hillsborough County) as well as all of Pinellas and Pasco counties. The mandatory catch-and-release ruling was set in place so certain fish killed during red tide have a chance to repopulate. The red tide organism Karenia brevis is still present in the aforementioned areas. Citizens should not eat any fish caught during red tide. According to FWC biologists, red tide is a naturally occurring event in Florida which usually starts offshore and is brought to the shore by current and tide. Violaters will be fined or could face jail time.